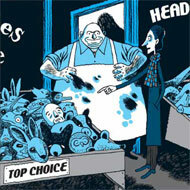 French cartoonist David B.’s 2002 graphic novel, Epileptic, was a surprise hit, declared the No. 1 comic of the year by Time and getting rave reviews in The New Yorker and the Washington Post. Now David B.’s next book, Nocturnal Conspiracies, is being released, and it’s as richly detailed and curiously familiar as Epileptic. This time David B. is exploring his own dreams, and the results are bizarre and beautiful.